This is the third book in a trilogy. 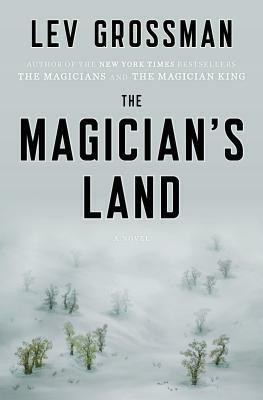 This review may contain spoilers for The Magicians and The Magician King. Quentin has hit a new low. He was banished from his beloved kingdom of Fillory and left behind being king and all of his closest friends. Out of options, Quentin returns to Brakebills, his alma mater, and works as a teacher. But his past soon catches up with him and he finds himself out on his own yet again. Meanwhile in Fillory, Janet and Eliot find their kingdom threatened by invaders and the very real possibility of apocalypse. I had some trouble getting into this story but I realize that the problem is self-made. If you have followed along with Quentin, Janet, Julia, and Eliot since the beginning, I would advise that you read through the first two books again before embarking on this newest adventure. It was hard for me to get back into this world and remember what the characters had been through since it's been a year and a half since I read the second book and much longer since I read the first. While this series is wildly fantastical, each book has important insight into growing up. In this book, Quentin finds himself in places he never imagined he would be. He was a king, after all. Instead of ruling, he finds himself fighting for what basically amounts to being a part of a magical heist. This part of the story will certainly ring true for people who did all of the right things - college degrees, internships, networking; but still found themselves scrambling for jobs at the bottom of the food chain. We begin the story at this moment and work both backwards and forward. One of Grossman's most interesting touches in The Magician's Land is his introduction of new characters in the last book of a series. Many writers would focus on their already established characters in the conclusion of their trilogy, but the new characters here really add to the story. Plum in particular sheds new light on characters that we already know and love. She is a fellow magician who works with Quentin on the heist and we eventually learn that the two of them have already met under very interesting circumstances. Grossman uses the relationship between the two to show how far Quentin has come and the differences between youth (Plum) and the beginnings of maturity (Quentin). Watching the pair work as colleagues and become friends is one of the best parts of the story. As Fillory faces the threat of destruction, Quentin encounters someone from his past who he thought was gone forever. As he tries to convince this person to embrace life again, there are striking parallels to loving someone with addictions who fights you every step of the way. Both in our world and in Fillory, the friends must decide what to fight for and what can be repaired. Part of growing up, after all, is deciding what to hold on to. Which relationships do we keep, no matter what, and what dreams do we let go with time? While The Magicians paralleled The Lion, the Witch, and the Wardrobe and the sequel paid homage to The Voyage of the Dawn Treader, the third book has some serious parallels with The Last Battle. Lev Grossman has created an incredible trilogy. He has crafted characters who experience great joy and tremendous loss, entire lands filled to the brim with magic, and a set of stories that manage to be both literary and the best kind of fantasy simultaneously. You don't want to miss reading this series. Wow. This sounds great! Thanks for the review. I'm going to put this on my TBR list. Hooray! Lev Grossman is such an interesting writer. I hope you enjoy! I didn't realize that there were so many Narnia parallels with this series. I've not read them yet (obviously, I guess) but all I kept hearing were the Harry Potter parallels. I like the way you describe these. I hadn't been particularly interested in them before, but you make them sound like don't-miss books. There are definitely HP parallels, especially since the first book is set at a magic school. But the school is a college instead of a jr. high/high school, so the things that the characters go through are different. The Narnia thing feels rather like an homage. There will be certain scenes where you go, "Wait a minute. This seems familiar..."
This sounds like an interesting trilogy (I loved the Chronicles of Narnia as a kid). I'm often too impatient to read trilogies, though. I usually dive into the later books without re-reading the earlier ones. I end up missing a lot when I don't remember the earlier books as well as I think I do.